WEDALI: Erl, Tom, Monika, Amy, Andrei, and Biz. And the Silver Bullet. We saw their coolness and countered in typical Alpine Shop style. You decide who wins pre-race picture wars. ALPINE SHOP: Jeff, me, Carrie, and David. We may not have an awesome RV but we have this furry pimp hat! OK anyway we drove over to Brown County State Park and checked in, finally met Abby Perkiss in person, got our packets and race swag (some really nice stuff in there! ), moved into our cabin, ate dinner at the lodge restaurant, discovered cake sauce, and then attended the pre-race meeting. We learned we wouldn't get maps until the next day which is always nice. 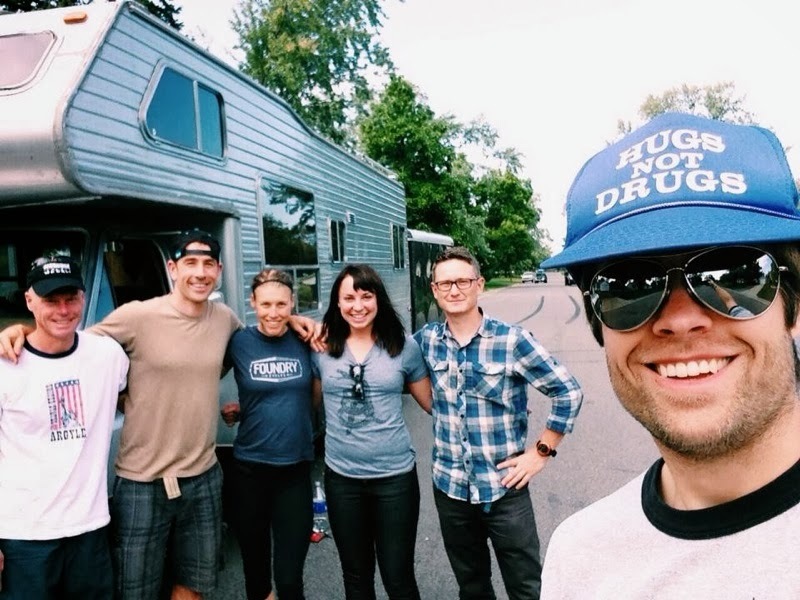 We were also able to say hi to tons of adventure racing buddies. This race was already feeling like a huge family reunion and I loved it. At the end of the meeting, Carrie introduced me to THE Kyle Peter...it was awesome to meet him. Race morning we were up at 0500 for breakfast, and then down to the lodge at 0600 to collect race maps and start plotting. We found a quiet spot in a service corridor that had great light, so we settled down there and planned our day. The plotting was short and easy which left us plenty of time to strategize and take bathroom breaks (planned or...unplanned). We packed our packs with about 5,000 calories and our bikes had another 1,000. Pretty soon it was time to line up for the 0800 start. My nerves were on high alert. I hugged Jeff and David and we all encouraged each other to have a good race. Let's do this! 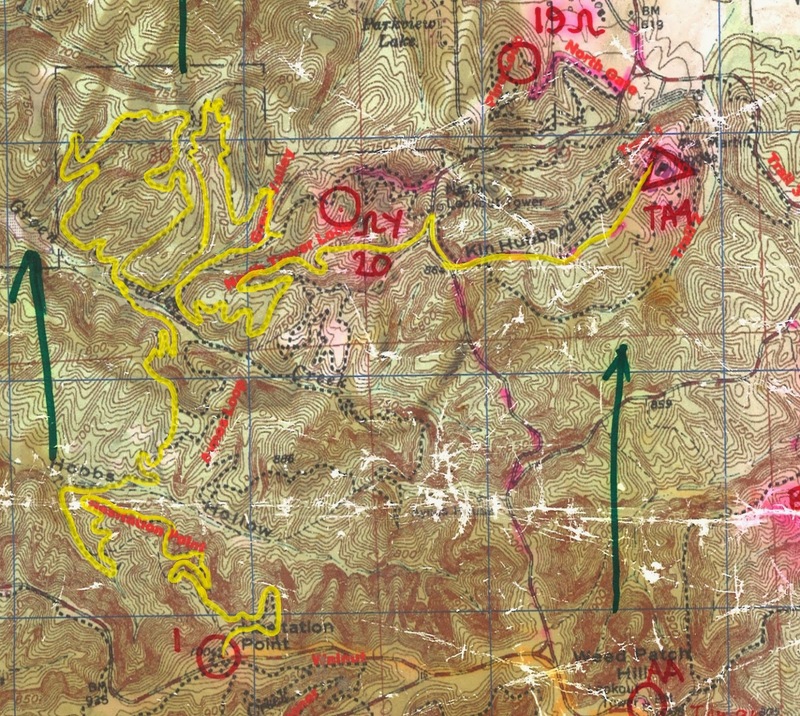 Start at Race HQ (the triangle/TA4) and run the yellow trail clockwise. The race starts with a literal BANG from a tiny cannon that surprised us all. Wow! We take off on a marked trail run for the main purpose of splitting the teams up before the singletrack. It's not the most interesting way to start, but pretty soon we're jogging along behind Bushwhacker. I always have a difficult time going hard in the beginning of races and this is no exception, but I just put my head down and try to keep up with the boys. David stops for a pee break, of all things, so now I just chase Jeff through the trees. We are all wearing our bike shoes and helmets so when we get back to TA, we just throw our packs on and ride out! We started at Race HQ (the triangle/TA4) and then got on the singletrack. 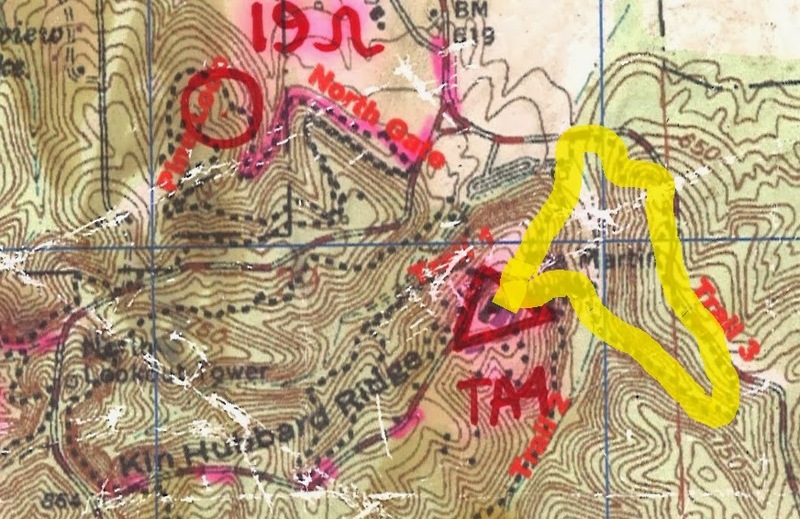 I really can't remember exactly which trails we took, the yellow line is just a guess, but we popped out of the woods at CP1 (Hesitation Point). We are a decent mountain biking team so we really want to hit the singletrack in a good spot to avoid any jam-jobs. Brown County State Park is known for super flowy fast trails and these ones are amazing. We don't even have to worry about navigation - the first 15 miles are marked with tape so we just shred along the course. David leads out a blistering pace as always and I try to hustle as much as possible to keep up. Jeff stops for some reason and motions me by, saying he has to check something on his bike. When he catches back up, he tells us that his fork is leaking air somehow and bottoming out. Uh-oh. Not good. He's locked it out for now and we're all hoping it will hold. Jeff, me, and Biz heading into the singletrack! USARA has stationed 3 volunteers along the course to hand out poker chips. To avoid teams short-cutting the course, we haven't been told where the volunteers are. We finally roll up on the first volunteer (Brian?) who hands us a chip and Jeff tells us he's been stung by something really nasty. It hurts more than a regular bee or wasp so we decide it's a tracker jacker (hi Team Virtus!). We continue crushing the singletrack even though my back starts hurting a lot from my heavy pack (3L water + race food). I stretch it out when I can and keep pedaling. Jeff's wife Carrie is volunteering for the race and we see her for our third poker chip in the last few miles of trail. She tells us we're top 10 and only a few minutes back from the next team. Awesome! Finally we make the climb up to Hesitation Point and just as we're about to cross the KOM banner, I get distracted and almost endo off the trail. Whoops! Keep the rubber side down! 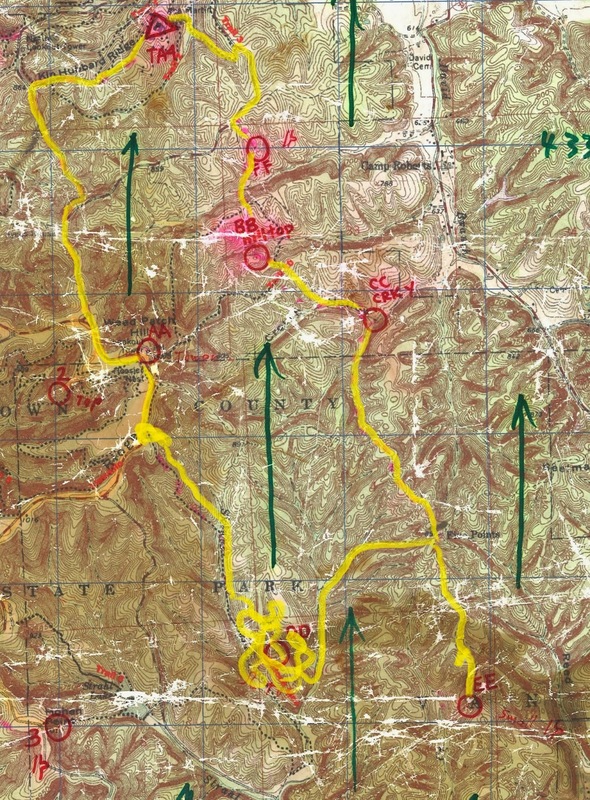 We punch CP1 and then get into the maps for the real race! 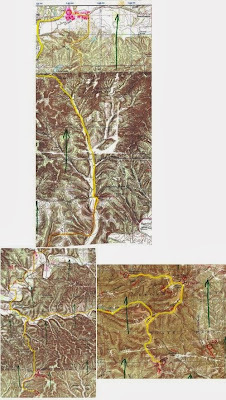 Started at CP1 (lower right map image), then got CP2, then out-n-back to CP3, then west for an out-n-back of CP5 and CP4, then north to CP6, then into TA1. Sorry the pic is weird - we cut our maps up later in the race. We bike on pavement to first two controls, CP2 and CP3, and then drop our bikes for some bushwhacking to the flag. We see a bunch of bikes at the drop for CP2, and our way back to them we see Bushwhacker ("is there beer back there?") and NSPIRE ("hi bugeater!"). There is a huge pack of bikes ahead of us which we believe to be Untamed 1 and 2, Odyssey Masters, and CPT. We attack CP3 with GOALS ARA, who is 2 guys racing with our super-fit Missouri friend Melisa! It's nice to see them having a good race, and I get to meet Abby's husband Brent. Awesome! Just as we're rolling out of CP3 we see WEDALI rolling in. Yikes! We somehow miss the trailhead to Trail 7, but David quickly re-routes us onto Trail 5 for the descent into Ogle Lake. Then it's onto some pavement and hard-pack gravel to CPs 5 and 4. On our approach to CP5, we see Dart travelling in the opposite direction and cheer them on wildly. Only a few minutes later, Tecnu comes blasting by chasing Dart and we yell that they are only a few minutes up. What a horse-race! 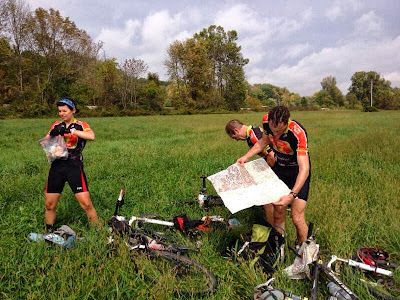 We drop the bikes for CP5 and have about 1k of bushwhacking for the punch. 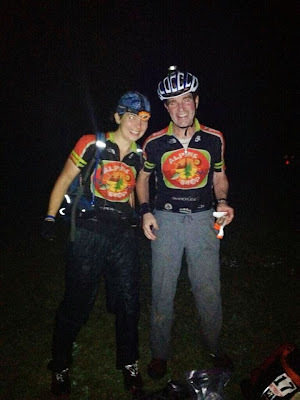 Then it's back to CP4 where we see Abby providing live race updates to the website. We tell her about Jeff's tracker jacker sting which is still really painful, but there's not much time to talk since SOG and Odyssey Masters and close on our heels. We start riding on a long northbound road section and take stock of everyone's status. Things are good, legs are working, Jeff's fork is holding air, stomachs are happy, we're racing Nationals!!! Somewhere before CP6, SOG comes flying close by us on their bikes. I do what any enterprising racer would do; I hop on their wheel. Jeff and David follow suit. We ride like this for a while and try to entertain our hosts by singing the Quark Song, an Alpine Shop classic. But pretty soon it's clear that SOG is not amused by our drafting so we decide to let them ride ahead (with Odyssey Masters and CPT) while we keep our team intact. Me, Jeff, and David in TA1, preparing to paddle! 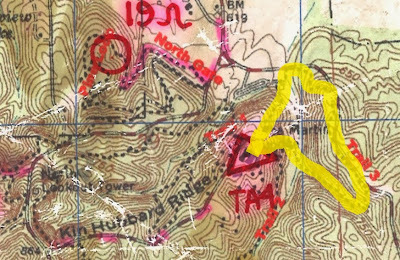 We miss our intended turn into TA1 (marked in orange highlighter on the map), but the re-route (yellow highlighter) is paved so we're not stressed about it. We roll into TA1 somewhere in or close to the top 10! We're finally able to shed some weight from our packs since we'll be returning to this location in a few (well, several) hours. We assemble paddles and try to choose a decent banana boat for our next leg. The put-in is reminiscent of Thunder Rolls' steep embankment, but we're happy to splash into the water. put-in at TA1, then follow Beanblossom Creek west. We knew the first section of this paddle would be tough. We're in the water with Odyssey Masters and CPT just ahead, except we can't do much paddling. The water is super low, so we have to walk and drag the boat to make any progress downstream. This is also reminiscent of what Jeff and David did at Thunder Rolls. Some teams might think this is horrible, but we're actually having a lot of fun with it. The air is hot and humid but the water is cool so it's nice to be soaking wet. All of us are good at jumping in/out of the boat and paddling in any position so we just communicate and make progress. 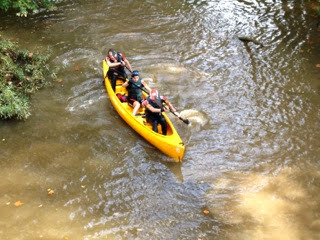 Wild Hares on the adventure paddle section. It's fun to be around the other teams, too. We all have slightly different techniques and we are all watching each other for the best results. CPT comes up with using tows on the front and back boat handles (made from their paddle bag straps). 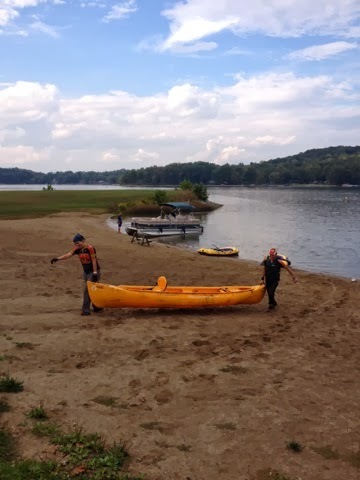 We come up with "zinging" which is pushing the empty boat forward in shallow water and then running on the shore to catch it a few meters later. Odyssey Masters comes up with throwing walnut fruits at us...wait...that's not a portaging technique, that's just good fun. We all have foolish moments in this section too; Jeff does a total faceplant in the mud, I jump into the boat from deep water and smack my head on the seat, and David...well David makes it through unscathed. Carrie gives us a split at a bridge that WEDALI 1 is only 6 minutes ahead so once we make it into the open waters of Lake Lemon we try to hurry up and catch them. 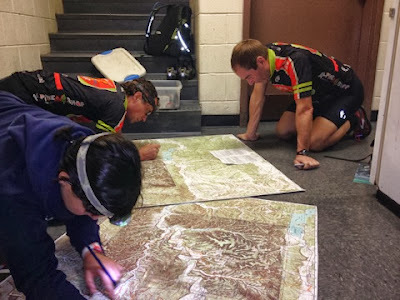 We finally do, at the take-out for CP8, but they make better time through the woods so when we get back there is no opportunity for another water-wrestling match between me and Erl. Boo. David, me, and Jeff paddling on a later section of the river. After successfully navigating the tunnel, we paddle over to a mud flat and beach the boat for the trek to CP9. We see WEDALI in the woods ahead of us, and SOG and Bushwhacker in the woods behind us. My legs have really started to complain about the sticker bushes so I stop briefly to put on pants...ahhhhhh sweet relief! When we return to our boat, we find a present left by a mystery admirer. It's a huge plop of mud left smack on our bow. It very closely resembles a cow pie. We instantly start cracking up! We scrape the mud off easily, hop back in the boat, and paddle back through the tunnel, all the while discussing who could have left this hilarious gift. Our money is on WEDALI so we are looking forward to interrogating them. 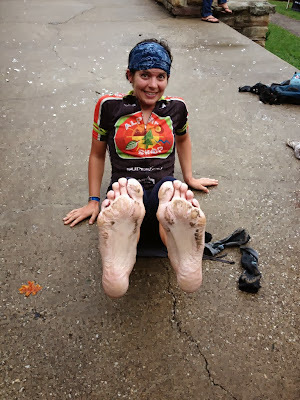 As we approach CP10, we pass CP11 where Carrie is stationed and she again gives us some encouraging splits. As we get closer, we notice that the boats in front of us are towing a raft, and only have two paddlers. We knew about the raft but where is the third teammate? As we pull up to CP10, the race staff gives us a surprise mini-trek. They are allowing all teams to split up so David marks up the map and takes off. Jeff and I hitch the inflatable raft up to our boat and start paddling towards CP11. As we're going there, we pass WEDALI 1 going the opposite direction and use this opportunity to yell at them about the mud present. They are acting all innocent, but we've seen this act from them before, so we're firmly convinced that they are the pranksters and start scheming ways to get back at them. 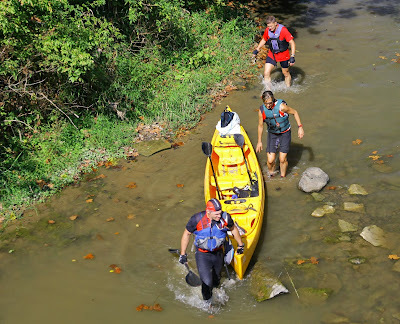 Once we get to CP11, we haul the canoe up to the drop zone and take in more splits from Carrie. Tecnu has a commanding 1h15m lead on us right now, and we are in 8th overall, within 10 minutes of 5th, and 9th-11th just 10 minutes back from us. Game on! And we haven't even started trekking! Jeff and I paddle the raft back to CP10/TA2 and have a few minutes before David gets back to clean shoes, restock water, and pack up our paddles. 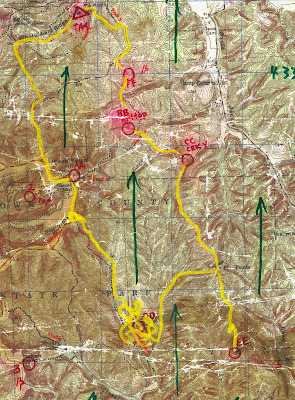 Start at TA2 (lower left corner) and trek back to TA1 (lower right corner). I remember our route pretty well to 15, but from then on it's a guess. We run out of CP12 and onto the first significant trekking section which will bring us back to our bikes at TA1. SOG is just ahead of us and they are making great time on the road running. We keep up somewhat, but by the time we are ready to attack CP13, they are out of sight. It's just as well because David prefers navigating solo. 12, 13, and 14 go really well, and then we pop out on a road on our way to 15. We do some running there and then find a summer camp (Waycross). Even though Jeff and I are still pretty stocked on water, we've been sharing with David and there's no telling when the next good source will be, so we ask some of the people milling about if we can use the hose. They oblige, and we all take mini-showers in the deliciously cool water. We're a little worried about the private property lines on the next leg so we take the road and then the trail to 15. The sun is gently setting so we put lights on and ping 15 with ease. 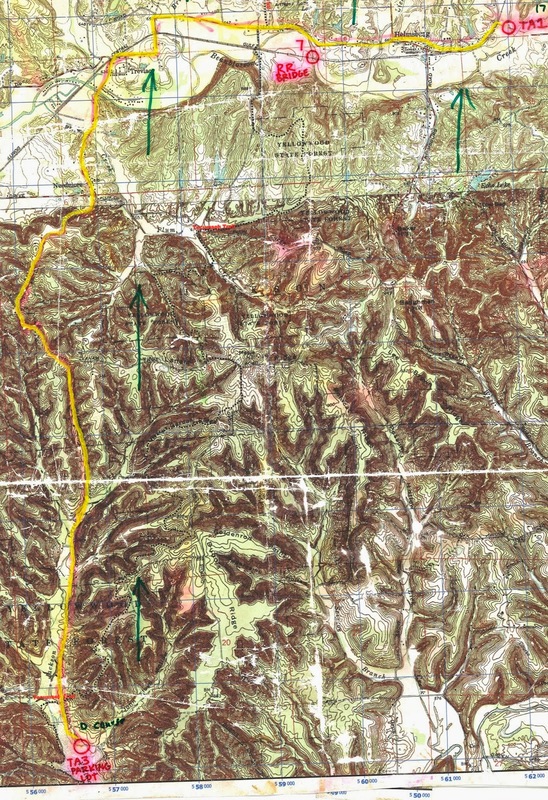 Even though the RD (Brian) told us that private property shouldn't be an issue, we're still worried about it for the trek to 16, so we use the Tecumseh Trail in questionable areas and then bushwhack when we know it's allowed. 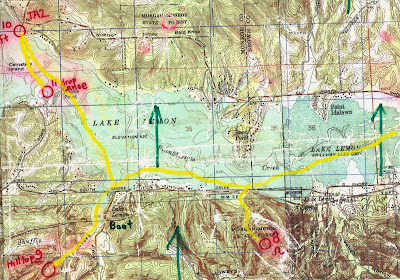 We trek straight into an unmapped lake (somewhere south of the "J" in Jackson on the map) that throws up a huge red flag for David, but he figures out what's going on and we keep trekking. Back on the Tecumseh Trail, we are running along and my headlamp pings an 8.5x11 laminated sign: TRAIL REROUTE. Hmm, what is this? 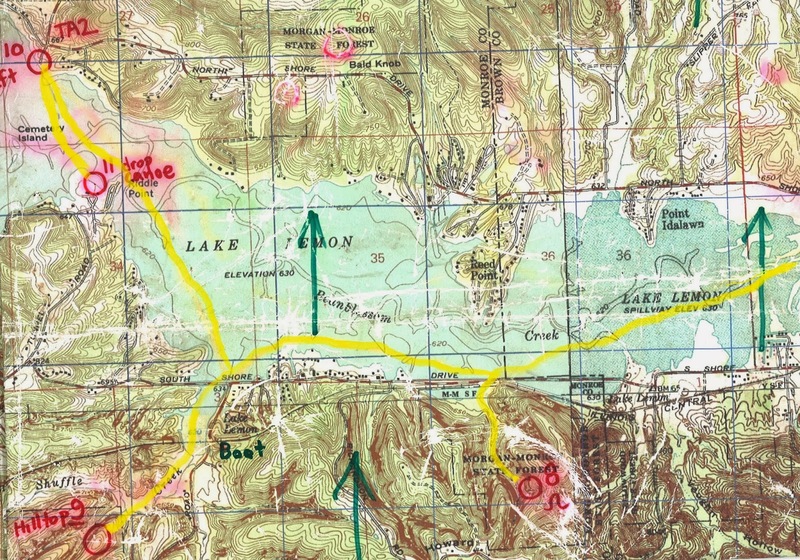 I read it quickly, and notice there's a topo map posted of the rerouted section. David consults his map and we decide it leads us exactly where we want to go. Sweet! The reroute is flagged every 1-2meters which is awesome. I lead the team through here and it's like we're on a white o-course. We pop out back onto the Tecumseh Trail proper, run along a ridge, and then drop into a creekbed for CP16. Except...there is no CP16. David is very confident we are in the right reentrant, in the right creekbed, but there is no flag to be found. What to do, what to do...we start by searching downstream. Nothing. Then we come back to our drop-in point and search upsteam. Still nothing, and now SOG has joined the party. Crap! David climbs the opposite ridge to relocate, comes back exactly to our original drop-in point, still nothing. And then, Jeff spots the flag in a brushy side channel of the original creek. Agony! Odyssey Masters' headlamps are just leaving the area so we chase them out onto the road and back to TA1. We're a little shaken by the blunder but we encourage ourselves that David's original nav was spot-on, we just couldn't find the flag once we were in the circle. Team error. Regroup and move forward. Carrie and Crystal (Mike's wife from Bushwhacker) are patrolling the road in a vehicle so they spot us and start yelling that 3rd and 4th place Untamed New England 1 and 2 are only 30 minutes ahead of us, having left TA1 just recently. Wow! We are super stoked to still be in the mix after our mistake so we fly through transition and onto our bikes in 5th place. Start at TA1 and ride to TA3. 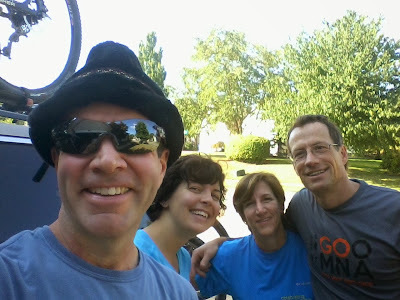 We have chosen a mostly paved route so we ride through Helmsburg and Trevlac. Somewhere along there we start thinking about water, and how we should probably get some before the night gets any longer. Just as we're thinking that, we pass a house with 2 guys chatting outside of it. Jeff rolls up to ask them for water and they happily show us where their spigot is. These guys are Hoosiers personified - smoking cigs, talking about trucks, wearing muscle shirts - and they couldn't be nicer. They ask us about the race and how we're doing and how much longer we'll be going. We chat right back as we fill up all of the bike bottles. As we're leaving, they yell down the road "if you need more water later, you know where it is! just come on back and refill!" Thanks, dudes. You are awesome. The rest of the ride is pretty simple and we are all enjoying the cooling breeze. My stomach started getting a little iffy at TA1 so I have stopped eating and am just taking in water in sips. Usually I have an iron stomach during races, so I'm a little worried, but I've eaten so much already (guessing about 3,000 calories in the first 13ish hours of the race) that 1-2 hours of reduced intake shouldn't be too bad, as long as I can rally later. We hit gravel into Yellowwood State Forest and are excited to see the blinky lights of TA3. There even seems to be activity in TA! We couldn't possible have caught Untamed, could we???? No. We didn't catch anyone. Those lights are SOG and Odyssey Masters who have somehow taken a better route here. We are really confused because besides our 5min stop for water, we had great pavement and smooth gravel the whole way. But, there's no time to ponder because we've got a TA to complete and some decisions to make about our next leg. We've been given a 1:10k o-map with 7 pairs of controls in a dogbone layout. We have to collect 4 pairs, but which ones we pick are up to us. While David is taking in the map, Jeff and I prepare for trekking by putting pants back on. The second I pull mine on, I'm in pain. The tough thorn-repelling fabric is very hurty on my scratched up legs. I've never experienced this before with these pants, but trekking in them now is going to be challenging. Jeff hears my whimpers and offers to switch pants with me - he has orienteering pants which are lighter and silkier. It doesn't take me 2 seconds to be convinced. Jeff's pants fit great on me, mine fit great on him, and pretty soon David's got the plan of attack all sorted so we run off into the darkness. me and Jeff switched pants! We attack the northern cluster of controls first and get T, U, P, and Q. The nav is not very challenging since they're all located <200m off a main trail. The veg is a little gnarly but Jeff deals with the lion's share of it. Then we take a trail run south and it's here that the heat hits us. You'd expect that at night, in Indiana, in October, heat wouldn't be an issue. 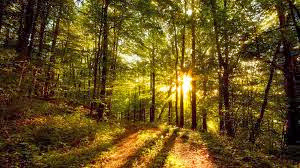 But somehow the humidity is higher than the daytime, the temps haven't gone down all that much, and the there is no wind in the woods. It's like we're marinating in our own sweat! I seem to do okay in the heat, and now that my stomach has calmed down I am moving fine. But both Jeff and David and thrown severely off their game. We have no choice but to slow down and regroup as a team. I take the passport for the punches on this southern section, and when we cross over ridges we're able to grab a slight breeze. We focus really hard on holding ourselves together and getting back to the bikes with minimal damage. We finally pop out onto the road for a shuffle back to TA. Carrie is still there and reports that SOG and Odyssey Masters came in together 30 minutes ago, and Bushwhacker and WEDALI should be back any second. Crap! We hustle through another transition and focus on the remaining race: one more bike section which should help cool us down, and then a final, challenging trek. We roll out of TA3 a little bit defeated, but we have a plan to regroup. Go slow, no more towing for me, eat some yogurt-covered pretzels one at a time, and keep each other drinking. We ride easy to CP17 which is up a big hill, but my legs seem to be churning out the granny-granny with decent energy. Then we have some blissful descents back into Nashville, which is just about the cutest town you can imagine. Think Gilmore Girls, in Indiana. We grab CP18 on the bridge and then do a little bikewhack back to the road. Then it's an easy road ride to the north entrance of Brown County State Park, and 2 more CPs on the singletrack that we take as out-n-backs. At CP20, we see lights, and learn they belong to Odyssey Masters! And how! We don't know how we caught up to them, but we're not going to ask questions, and instead hustle back to TA4 (same as start/finish line) and onto the final, decisive trekking section. We start this last trek in 7th overall, behind Tecnu, Dart-nuun, Untamed 1 and 2, SOG, and Odyssey Masters. We check in at TA and then go back to our cabin where we've got dry shoes and water. I also take time to put on some capri tights under my trekking pants to help protect my scratched up legs. I also switch from my Cascadias, which I've been wearing all race, to my Hoka Stinsons which are a new experiment. Sure, it's a slight risk to wear newer shoes, but my feet hurt and I wore the Hokas off-trail last weekend where they did fine. Jogging out of the Abe Martin Lodge area, the Hokas are pure bliss. My feet have never been so happy! We have all recovered from the sweatbath of Trek 3 and are ready to finish this race strong. Odyssey Masters is jogging along the road just in front of us so we use them for pace motivation. Just as we're passing them, we see three headlamps bobbing down the road coming toward us. I have my suspicions who they belong to, but I call out anyway "Who are you? "....no response. I try again "What team are you?" ...nothing. Finally, they are getting really close, I yell "Hey silent people, what's your name?" And then, a voice from the darkness..."We are Team Tecnu." We know they've won so we freak out, yelling congratulations and slapping high fives as we run by. 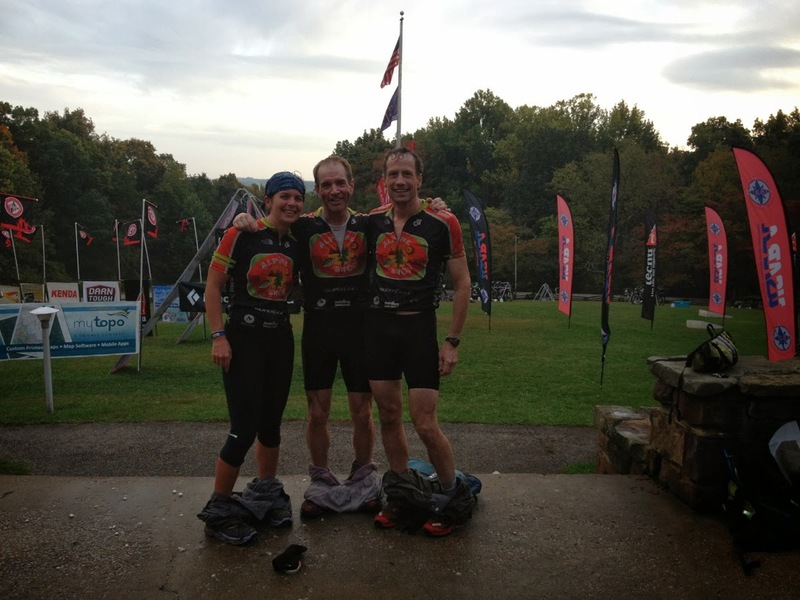 They've just crushed the course and we're really happy that they had such a great race. Nice job, Tecnu!! We continue our long jog to AA, the lookout tower, with Odyssey Masters and both punch there at the same time. Then it's a long leg to DD, and we start looking for the trail off the main road before Odyssey does. No trail. We descend a little further. No trail. This is really weird since the trail is overlaid on the map, and the same overlay was used for the mountain bike trails which was accurate. So either we're really failing at our nav, or the map is overlaid inconsistently. Bummer, either way! We spend some more time hacking through the woods before regrouping and coming up with a new plan. We'll just descend into the creekbed and then work off of features to find the correct reentrant for DD. No biggie, we do this all the time, let's get started. As we're trekking in the low area, the rain starts. It's not a big deal since we've all been hot and the rain helps cool us down. But, it makes visibility in the dark woods really difficult - our headlamps ping the raindrops instead of features. Somehow, we get really turned around and have a hugely difficult time with DD. We finally end up on a ridge and just start checking the tops of all of the reentrants. Finally...jackpot! dadada! dadada! We've probably lost at least 45 minutes with this debacle, but we're really proud of ourselves for constantly adjusting our attackpoints and persevering until the flag was found. I've started to get cold so I dig out my rain jacket and am silently pleased to be actually using most of the mandatory gear. From DD, we have another choice to make. Do we take the trail around-route to EE? Or do we bushwhack straight for it? David's brain is a bit fried, and I've started to succumb to sleepiness, so as a team we are lured into the perceived simplicity of following a trail. Odyssey Masters has joined us once again, reporting similar trouble with DD, and with news that Bushwhacker has now entered the area. Oh dear! We love our friends from B-dubs but we really, really would rather not see them until the finish line. The trail we're using is a wide, double-track horse trail, and the rain has turned the already poor conditions into something resembling a Skate-O, minus all of the sequins and glitter and knee clubbings. The six of us are slipping and sliding along while David and Mark try to keep their heads in the maps. Not easy! We finally attack EE, but we do that too soon and Odyssey Masters (smartly) does not follow us. So another few minutes spent thrashing in the brush unsuccessfully, before we relocate correctly, re-attack, and punch. And see Bushwhacker passing us. They are moving well and we are a bit frazzled. We have a long leg to CC which is the beginning of the end for me. My feet are not happy any more in the Hokas - somehow the shoes are holding a lot of heat, and my toes are a bit more cramped than normal, causing excess sweat and friction, causing blisters. Suboptimal! And it's dark, and I'm sleepy, and we're low on team mojo. I retreat into a silent zombie trek - mostly hiking with bursts of painful jogging. My headlamp is growing dim, and none of my food sounds good any more, not even Oreos. 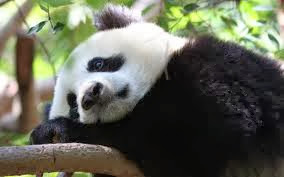 What a sad panda! Jeff and David continue to be awesome, asking what they can do the help me, but my feet are the driving factor of my slowdown and there's not much to be done there. We complete CC and BB in a daze. Looking back, I'm really not proud of this part of my race. I should have asked my teammates to get me talking, start asking me crazy questions to keep my mind in the game and off of my problems. Lesson learned for next time! It was almost this pretty. Finally, we are attacking FF, the last checkpoint, and we start to see other teams. WEDALI 2, Rib Mountain, CPT, are all buzzing about and it starts to lift my spirits a little bit. They seem to be attacking from the north, which means we might still be ahead of them, but my brain is just mush and I'm certain we've lost at least 10 places. I even tell that to Jeff in an rush of disappointment, but he assures me that we're still in the top 10. I have a hard time believing this, but I dig deep into my barrel of optimism and keep hoping. The sun has risen and we are on the road back to the finish line. Then we join up on the trail from Trek 1, the same trail we ran a mere 24 hours ago, and see the flags around Abe Martin Lodge. We've made it! We cross the finish line just a few minutes after our friends from Bushwhacker. Somewhere there's an official photo but I can't find it! Carrie is there to greet us, and the race staff tells us that after 24 hours and 19 minutes of racing, we're the 7th place coed team, and 8th place overall (Odyssey Masters finished ahead of us). With the caliber of teams racing here, we thought a Top 10 finish would be awesome and a Top 5 finish incredible, so we are very pleased with our 8th place overall. my feet look like a topo map! Bushwhacker is still around the finish line so we hang out and chat with them. I think it's here that they slyly ask "So, how did you like the paddling after CP9?" AH-HA!!! It was Bushwhacker, Fredrik specifically, that left us our mud present!!! We congratulate him on the cleverness and hilarity, saying that we laughed about it for almost the entire race. It's especially funny that we blamed it on WEDALI and they had no clue. We'll be laughing about that one for a long time. While we're swapping race stories, I start to itch. Like all over. It's...awkward. Mike gives me a Benadryl, but I finally it gets so bad that I can't even focus on conversation. I dash back to the cabin and start the long body and gear clean up process. The rest of the day is spent eating, napping, and attending the awards ceremony. Then on Sunday we pack up the van for the return trip to St. Louis for some uber-fast recovery before Checkpoint Tracker Nationals! Thanks so much to everyone who cheered for us, both in person and on the interwebz! We really, really appreciated it. Thanks to Carrie who was an awesome volunteer and then race-update-provider! 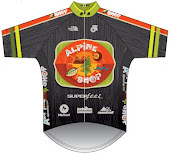 And finally a huge thanks to Alpine Shop for supporting our crazy crazy adventures! Congratulations!! It was so exciting to follow along on Facebook and the race site...refresh...refresh...refresh....constantly excited for any new news. You guys seriously rocked that race!! I get quiet when I'm struggling too, and I need to do better about speaking up when there are things that can be done, even if all there is to do is distract. Thanks, Kate! We felt like it was a solid effort, and proud to represent the MO/IL racing community! hahaha, those feet were better seen and not felt!